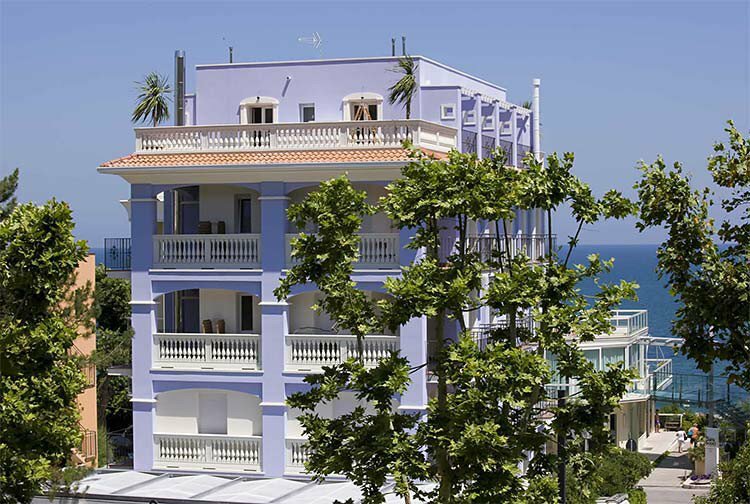 Hotel Rock Crystal is a 2-star hotel located a few steps from the beach in Gabicce Mare. It has a paid parking and garage, an outdoor bar, free WI-FI throughout the entire hotel and a free shuttle service to the beach. Accept small and medium-sized animals. The hotel enjoys a privileged position: on one side it overlooks the beach of Gabicce Mare, on the other side of Monte San Bartolo. The structure is also near the center of Gabicce Mare and numerous sports centers. There are different types of rooms (standard, superior), all with balcony (many with sea view), satellite TV, safe, fan, private bathroom with shower and hairdryer (in 10 rooms). The shower box is present in the superior rooms and suites. On request: minibar. FAMILIES: communicating solutions are available. They consist of kitchen with kitchenette, dishes, oven, fridge and freezer. The room is equipped with a color TV, a sofa bed, a washing machine, a bathroom and a double bedroom with a balcony and sun loungers. They can comfortably accommodate up to 4 people. Outdoor bar, rumpus room, TV room, elevator, luggage storage, night porter, late check out subject to availability. PARKING: covered and uncovered, garage 30 meters from the hotel, subject to charges. AIR CONDITIONING: not available, in the rooms there is ceiling ventilation. CONVENTIONS: beach, free shuttle service to the beah affiliated with the hotel. BREAKFAST: buffet with cakes and homemade desserts, jams, yogurt, cereals, biscuits, fruit and savory dishes. LUNCH AND DINNER: two choice menus and buffet of appetizers, vegetables and fruit are served. The kitchen is the protagonist of the traditional dishes of Romagna and Marche, prepared according to home recipes. Pasta and desserts are homemade. In hotel: strollers, outdoor playground area. At meals: baby menu, baby food, kitchenette for mothers, high chairs, bottle warmers. The hotel has an agreement with the beaches n. 42/42/44, equipped with cabins, children's playground area, table football, entertainment, mini-club, toilet with changing table, relaxation area with magazines, bars and restaurants. Prices are per person, minimum 3 days, including VAT. The hotel price list indicates prices in Full Board, excluding the first and last time that they are in Bed & Breakfast. - Parking and / or garage are available susceptible to availability upon arrival. The delivery of the car keys is at the reception. The day of departure must be vacated by 10:00. - The stay begins with lunch and ends with breakfast. - The meals not consumed in the Hotel will not be refunded (on request can be replaced with packed lunch). - Discounts for bookings with deposit, possibly valid for another period. Super offer to live Easter and Spring Bridges in complete freedom. Package only for bed and breakfast buffet, starting from € 27.00 per person per day. April 25th and May 1st in Gabicce! Super offer April 25 and May 1 in Gabicce in total freedom. Package only for bed and breakfast buffet, starting from € 27.00 per person per day. Super offer April 25 and May 1 in Gabicce in total freedom. Discounts for children as per the price list.